How to Play: This game should not be mixed up with Tri-Dimensional Chess (Tri-D Chess) seen on Star Trek movie nor with Three-dimensional chess (3D chess or Raumschach) invented in 1907. This game is rather a regular 2D chess with 3D view. 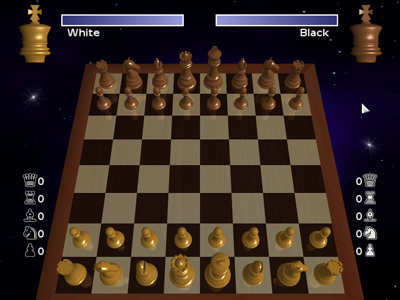 It can begin as normal chess online - with whites started by you against the computer. You can also choose to play "black", so that the computer starts first. You can choose between 3 difficulty levels where you set the level of how "smart" the computer will be playing against you. Good luck and good moves!